Of course, Captain Sherrill is not who he seems to be. In fact, he is Sir Ian Sherrill, an important government spy who has been forced into a sabbatical by his injury. His cover story of having been injured in the Americas doesn’t quite fadge, so Maggie begins to doubt him and his motives. In the meanwhile, Ian is on the hunt for a murderer, going so far as to call in his languorous and drawling fellow-spy, Peter Blakely, to help. As his wound heals, he and his comrade–an obvious copy of The Scarlet Pimpernel‘s Sir Percy Blakeney–begin their investigation, carefully charming information out of the odd cast of characters that surround Bride’s Leap. Although Bride’s Leap is an enjoyable book, it suffers from lackluster secondary characters. Of course, not all are bad. Constance stands out in one’s memory, as do the bossy and voluble vicar’s sister, Leonora, and the brow-beaten vicar, Richard, who doesn’t ever utter a word. However, Peter Blakely–who should be as fascinating as Sir Percy–doesn’t live up to his prototype. Other characters that are necessary to give a Gothic tale punch are bland enough that they don’t stand out until the end of the book. Overfield’s work would have been more impressive if she’d managed to develop all of the characters fully. Maggie and Ian are better. The heroine’s recent rise in social status and the hero’s disguise, which lowers his status considerably, mean that they are at loggerheads. Maggie is blunt with Ian, who is not used to being questioned. Ian is top-lofty and arrogant, an attitude that doesn’t sit well with Maggie. Each is frustrated with the other. Why does Ian insist on dictating what Maggie should do with her life? And why won’t Maggie just listen to Ian’s orders instead of repeatedly putting herself in danger? In Bride’s Leap, mutual antipathy leads to love. The protagonists’ heated interactions give their scenes chemistry, and for once the hero’s “damaged-by-love” doubts are justified by his past experience. Although I am not certain that their path to love is 100% believable, I’m willing to excuse the flaw because Maggie and Ian are so enjoyable as foils to each other. As a Gothic novel, Bride’s Leap delivers. Overfield creates enough mystery to keep the reader’s interest, the bad guy(s?) are not obvious, and both Maggie and Ian get to participate in solving the puzzle. Yay! Indeed, details of the climax surprised me while remaining plausible. That hasn’t happened a lot recently, especially in Gothics in the “Anne Radcliffe” (as opposed to “Monk Lewis”) tradition. Usually, the authors of the Gothic-Regency crossovers have not disguised their mysteries sufficiently, probably because they are more focused on their protagonists’ romance. Alas, this actually harms the developing relationships more than it helps them. 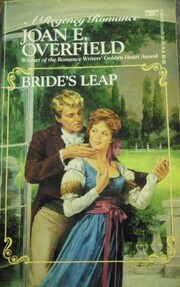 Bride’s Leap isn’t as memorable as Overfield’s A Proper Taming. However, it is a good book. I enjoyed it, even if it won’t make my “top ten” of 2012. Verdict: worth reading.